Kadampuzha Bhagavathi Temple is a famous Hindu pilgrimage centre in Malappuram District, Kerala, India. 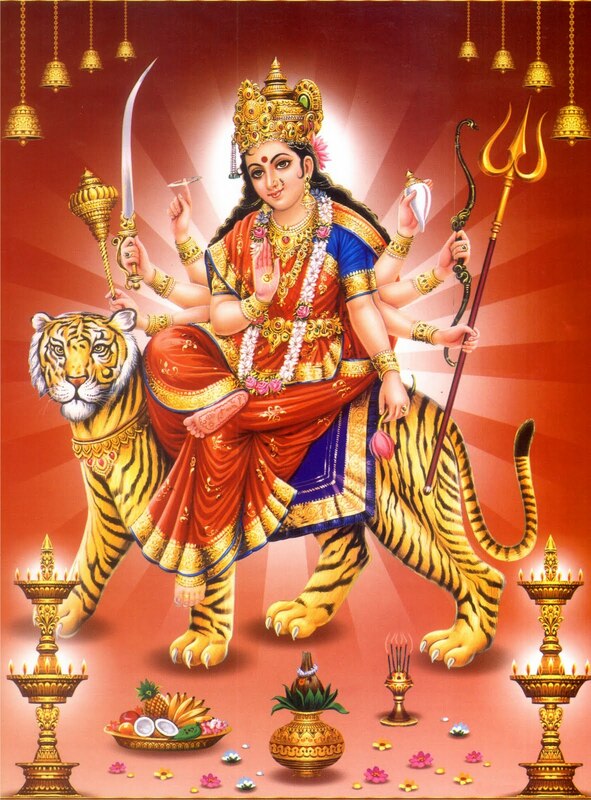 The temple is dedicated to Vana Durga. Kadampuzha is a small town in Malappuram district of Kerala. It is the major town of the Marakkara Panchayath. Kadampuzha is famous for the Bhagavathi Temple, which is one of the famous pilgrim centres in Kerala. Kadampuzha is 2 km east from the Vettichira Junction in National Highway -17, between Valancheri and Kottakkal. Kadampuzha also makes the shortest route between Tirur and Perinthalmanna (through Pang-Padapparamb-Puzhakkattiri), though bus services are very less in the route. Kaadampuzha is the short form of “Kattalan Ambaitha Azha”(Place where the Archer fought with arrow and bow). The legend relates to Mahabharatha. The Devi temple, owned by the Malabar Devaswom Board under the Government of Kerala, is administered through a trust consisting of the Variar family and non hereditary co-opted trustees. The town of Kadampuzha was once in the hands of the “Thekkencheri” Nair family, but in the 1860s most of their land was lost. There is another temple, Madambiyar Kavu temple, situated a short distance away from the Devi temple, which was originally constructed and maintained by the Nair family. The idol of the Madambiyar temple is Lord Shiva in his “Kirata” incarnation. The sreekovil is small about 12’x8′. With in the sreekovil a small hole of about 1 1/2″ diameter is there where Ganga was brought to Devi by Lord Siva for her thirst. It is covered with silver cap over which an Angi of Devi is kept. There is no idol. Angi is removable. Behind the temple a small forest of the same size of 12’x 8′ is available. With in the sanctum, there is sankalpam of Lord Ganapathi and Lord Siva. Sankaracharya reached the bright divine light of Devi reciting Narasimha manthra and Suarsana Manthra. Accordingly in front of the sreekovil in a raised floor there is Sudarsana and narasimha installed. On the left there is temple well, on the right there is Nagakanya and a Palamaram. Eastern side is Thidapalli where Nivedyams are prepared and Ganapathi pooja is done. We can circumbulate temple. A story regarding the Devi says that the Pandava Prince, Arjuna, fought with Lord Shiva during his Kirata incarnation (he was accompanied by Devi Parvathy during her Vanadurga incarnation). A demon named Mukasura took the form of a wild boar and started destroying the trees and shrubs around Arjuna. Arjuna was in deep meditation at the time, in order to get the Pasupathasthra (a divine arrow named “Pasupatham”) from Lord Paramasiva. Both Arjuna and Shiva shot at the wild boar and both claimed that his arrow had killed the animal. They argued, and finally agreed to fight a battle with bow and arrow. The victor of the battle would also get the honour of being the killer of the wild boar. The ensuing battle was fierce and Arjuna was defeated. Despondent over the defeat, Arjuna placed a big stone in front of him and started praying to the mother of the universe Parasakthi while showering flowers over the stone. He was amazed to see that the flowers fell at the feet of the Kirata and Kirati. He realised that those people were actually Lord Paramasiva and Devi Parvathy. The Lord and Devi Parvathy were pleased with Arjuna and gifted him with the Pasupathastra arrow. Another legend says that Adi Sankaracharya, during his travels, once happened to pass through Kadampuzha, which was then a grassland. At one place he could not pass further, as he seemed to strike an invisible wall. He understood it to be the meeting point of the Goddess Parasakthi in her Devi Parvathy incarnation and Lord Parameswara in his “Kirata” incarnation. Adi Sankaracharya prayed to the Devi and she appeared before him. After blessing him, the goddess disappeared into a small hole in the ground. He did the first poojas to the devi there on that day in Vrishchikam (November–December) and the sanctum of the temple is said to have been built around that hole. There is no idol in the temple. Muttarukkal and Poovu-moodal are the unique two offerings of this temple. Muttarukkal is for the clearance of obstacles one faces in his life (it is believed that these obstacles are made by black magic of the enemies). The performance is simple the temple priest with chanting some mantras break a coconut by hitting it on a stone placed near the Shree-kovil. Only expense to be met by the beneficiary is giving some ‘present’ known as dakshina and a meager donation to the temple. This regarded as the most favorite performance of the deity; this offering is based on a myth. Once upon a time Arjuna had a conflict with Lord Shiva (who was under disguise as a barbarian hunter). When Arjun not knowing who the opponent was; showered Lord Shiva with his arrows, Shree Parvathi by her magical power converted the arrows in to flowers. Arjuna was wonderstruck and fell at the feet of Lord Shiva. This offering of Poovu-moodal is symbolic representation of that myth.. The flowers of ‘thetti’ or ixora plant (West Indian jasmine) are used for the function; about four measures (one measure is about ten liters). One measure of offered rice and payasam (an Indian delicacy made of rice, sugar-candy and cardamom) are also part of the function. The temple open early morning 5 AM. The first offering to Devi is puffed rice (Malar) at 5.30 AM. Simultaneously there will be Ganapathi homam in the Thidapalli. 7 AM there will be usha pooja, then at 9 AM morning pooja and after noon pooja with poomoodal is by about 10.30 AM. The temple closes after Uchapooja and deeparadhana and reopen in the evening by 3.30 PM. Accordingly Devaswam counters function from 6 AM to 11 AM and evening 3.30 PM to 5 PM to facilitate payments for offerings. The chief priest take nivedyam prepared in the temple after uccha pooja only. He will not take any other food earlier in the morning and after noon. The main nivedyams in the temple are Malar,Trimadhuram, Appam, Vella nivedyam, Nei payasam and Palpayasam with Poomoodal. There is only one time nivedyam and poojas for Upadevathas.Pure ghee only is used in the temple for lighting, all preparations. The temple has a guest house for the convenience of devotees coming from far away places. There is a dormitory for which the charge is very nominal, Rs 20. There are ten double rooms (Rs 200), 6 deluxe rooms (Rs 350) and 2 suites (Rs 500). There is large number of Lodges and Hotels are available here. Though the temple is very famous all over Kerala, there is no major festival. The only festival, if it is a festival, is on Karthika day of Malayalam month Vrichikam (November-December). During this day there is Annadhanam (food gifting) to over 10000 devotees.